s t y le me d ia a n d d es i g n , i n c .
w w w. s t y l e m a g a z i n e c o l o r a d o . c o m w w w. m e d i c a l a n d w e l l n e s s . c o m PUBLISHER Lydia Dody | lydia@stylemedia.com MANAGING EDITOR Angeline Grenz angie@stylemedia.com CREATIVE DIRECTOR Scott Prosser SENIOR DESIGNER Lisa Gould DIGITAL DIRECTOR / BUSINESS DEVELOPMENT Austin Lamb | austin@stylemedia.com ADVERTISING SALES EXECUTIVES Jon Ainslie (970) 219-9226 Lydia Dody (970) 227-6400 David Knight (970) 619-9846 Saundra Skrove (970) 217-9932 OFFICE MANAGER/ABOUT TOWN EDITOR Ina Szwec | ina@stylemedia.com ACCOUNTING MANAGER Karla Vigil CIRCULATION MANAGER Trisha Milton COPY EDITOR Corey Radman PHOTOGRAPHER Marcus Edwards Photography CONTRIBUTING PHOTOGRAPHERS Bridget Eldridge, Fairy Good Photography CONTRIBUTING WRITERS Emily Hutto, Heidi Kerr-Schlaefer, Corey Radman, Kay Rios, Michelle Venus AFFILIATIONS Fort Collins Area Chamber of Commerce Greeley Chamber of Commerce 2014 STYLE MAGAZINES January-Northern Colorado Medical & Wellness Magazine and McKee Medical Center & North Colorado Medical Center Medical Directory February-Style March-Northern Colorado Medical & Wellness April-Style May-Style June-Style July-Northern Colorado Medical & Wellness August-Style September-Women’s Health & Breast Cancer October-Northern Colorado Medical & Wellness November-Holiday Style December-Best Of & Winter Activities Style Media and Design, Inc. magazines are free monthly publications direct-mailed to homes and businesses in Northern Colorado. Elsewhere, a one year subscription is $25/year and a two year subscription is $45/year. Free magazines are available at more than 275 locations throughout Northern Colorado. For ad rates, subscription information, change of address, or correspondence, contact: Style Media and Design Inc., 211 W. Myrtle St., Suite 200, Fort Collins, Colorado 80521. Phone (970) 2266400, ext. 208. Fax (970) 226-6427. E-Mail: ina@StyleMedia.com ©2014 Style Media and Design Inc. All rights reserved. The entire contents of Style Magazine are copyrighted and may not be reproduced without the expressed written consent of the publisher. 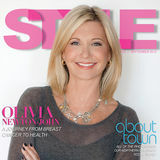 Style Media and Design Inc. is not responsible for unsolicited material. All manuscripts, artwork, and photography must be accompanied by a SASE. 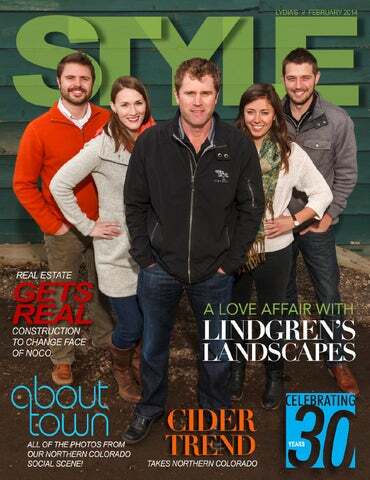 The views and opinions of any contributing writers are not necessarily those of Style Media & Design Inc.
on the cover The Lindgren design team, with Tim Lindgren at the helm, is creating stellar, award winning landscapes in Northern Colorado and beyond. Read about their business success on page 18. Cover photo by Marcus Edwards Photography. 40 TRAVEL: BEHIND THE SCENES IN BRECKENRIDGE. . . . . . . . . 44 FAMILY FOCUS: TEACHING KIDS ABOUT MONEY. . . . . . . . . .
AN OUTDOOR WEDDING TRANSFORMATION Homeowners Rhys and Judy Christensen approached Alpine Gardens early last spring with the goal of remodeling a section of their acreage in Fort Collins. This remodel was special because it was to prepare for an outdoor wedding to take place in the late summer months. After several consultations and design concepts, the decision was made to remodel an existing hillside walkway and terraced flagstone patio that encompassed cherished views. To make way for new concepts, existing hardscape materials were removed and staged onsite and then incorporated back into paths and natural stone retention walls in the new design. Existing plant material was also staged and transplanted around the property with much help from the homeowner who shares a passion for gardening. This particular type of project took careful consideration during the construction phase in order to minimize the disruption of the surrounding landscape. Proper planning and management assured disturbed areas had ample time to recover for a wedding date that was right around the corner. During a custom project like this, the building phase really takes on a life of its own and is very exciting for everyone involved. Artistic freedom was given to foreman, Brandon Vannest, and his crew who delivered with key boulder placement, meandering stone slab steps and intricate flagstone radial patterns. At the end of the project, the homeowners had all they needed to pull off the very special day and an enduring landscape to enhance their outdoor environment for years to come. performing to Middle Eastern and Indian music, Andean flute music by Marie Louise Borak, European folk music by accordion player Martin Limbird, and Spanish romantic and classical guitar music by Piatro. Open to the public, the evening starts with early bidder purchasing and a VIP reception from 5 to 6 p.m. General admission to the event is from 6 to 9 p.m. Reservations are $50 for general admission and $75 for the VIP reception and can be made at the Museum, 200 West Mountain Avenue, Fort Collins, or online at www.globalvillagemuseum.org. For more information, please call (970) 221-4600 or visit www. globalvillagemuseum.org. Support a true local gem, KRFC Radio. KRFC’s 11th annual Birthday Bash is a big, happy celebration of their decade-plus of music programming (with a special focus on local talent) and community affairs segments. The Birthday Bash will highlight two Colorado bands – one of international renown, but they’re not saying who the mystery guest is just yet. There will be a contest with free VIP tickets to the lucky winner who can guess who the headlining act will be. The Birthday Bash takes place March 29th at the Lincoln Center. The party starts at 7:00 p.m. Co-presented by the Fort Collins Downtown Business Association. Visit www.krfcfm.org for more information. The High Point Financial team at a strategy session. Ryan Behm Behm derives the most enjoyment from his 13-year financial advising career in listening to the client and providing strategies in line with what they want to accomplish. “This really helped me in developing a plan that is client-centric.” Behm received a bachelor’s degree for business administration in finance from Concordia University Saint Paul, MN. He is a third generation advisor focusing on the Christian market and is experienced in solving complex financial issues for families and businesses. He is an Investment Advisor Representative with Eagle Strategies. His hobbies include volunteering, church activities, and fishing, camping and snow skiing with his family. He and his wife, Taneal, live in Windsor with their three children. – William Arthur Ward. This quote defines their practice, says the High Point Financial team. For more information about High Point Financial, visit www. highpointgrp.com. is a wonderful tool but I’ve found that many people who surf the Net become more confused and then come to us to get clarification. We help them understand the terminology and redefine it in an understandable way.” Advisors can help at any point, Behm says. “It can be as basic as ‘Budget 101’ or as complicated as how to set up full estate planning. We offer a full spectrum.” The client-based mission has been in place since the beginning when Hudspeth, Wills and Tom Post started the Lakewood company in June 2003. “After my first five years in the business, I found there was too much in the industry, technology and knowledge to do alone so I started to add people,” Wills says. Hudspeth and Wills were working out of Denver but spending several days a week in Fort Collins and, with their community connection to Colorado State University, they felt a Northern Colorado branch would be beneficial. It was a simple thing to bring the others on board. “Through our affiliation with New York Life, the four of us saw something working well in Lakewood. We decided it would be great to affiliate with High Point,” says Fries. “We all have strengths in different areas and we also overlap,” Wills says. “That’s helpful for the client and for me because it’s too hard to master all of those things alone.” For Eastman, one of the draws to joining High Point was how much everyone cared about the clients. “And we also impact the community.” Litchfield agrees. “We believe in giving back and have been involved with Hope Lives, with Colorado State University, the Count on Me golf tournament benefiting the PVH Cancer Center and NOCOShares. There’s a sense of humanity at High Point.” To contact High Point Financial, call (970) 2661700. Their office is located on 3003 E. Harmony Rd., Suite 120, Fort Collins. Barry Eastman “I believe in the Give First philosophy and I enjoy knowing that I have made their lives better now and in the long term,” Eastman says. Eastman is a native of Loveland and graduated valedictorian from Thompson Valley High School. He received a bachelor of science from CSU. He has been a financial service professional for New York Life since 2010. His specialties are business planning, asset management, tax efficiency strategies and overall financial planning. His interests include technology and computers; fishing, camping, outdoors; playing sports including soccer, football and fitness; and travel. He and wife, Tammy, have three children. Barry will be joining High Point after April 1, 2014. Matt Fries “The greatest feeling in the world to me is when I have earned my clients’ trust,” Fries says. “When complete trust is established in the relationship, solutions to specific issues become possible and results become realistic.” Fries graduated from Fort Collins High in 1985. After many years in business and a stint as a school development administrator, he joined New York Life in July 2010. Fries specializes in working with business owners and professionals, which includes the owners/principals, their families, their employees and their families. Fries enjoys horseback riding and anything outdoors with his family, especially in the mountains. He and his wife, Suzanne, have three children and two grandchildren. Bud Litchfield Litchfield enjoys helping people. “It’s seeing that, through the work they do with me, they reach their goals and objectives.” Litchfield and his wife moved to Colorado in 1986 as owners and operators of Litchfield Associates, a manufacturer’s representative for a high-end furniture line. The job kept him away from home 50 to 60 percent of the time and that brought the realization that maybe another line of work was in order. In 1992, he became an agent and registered representative with New York Life and NY Life Securities. His specialty is the retirement market and all of the components of estate planning. His hobbies include travel, golf, woodworking and sailing. He and his wife, Carol, have four children and five grandchildren. We can help you with all your real estate needs! A home is much more than your castle. It’s where families grow, traditions are created and memories are made. It’s where dreams begin. Lindgren’s staff is young and energetic, and dedicated to creating one-of-a-kind landscapes for every one of their clients. to what they want. While there is a strong focus on what the project will ultimately look like during the design phase, structural and underlying components are planned here as well. A properlygraded landscape makes it more water-wise, directing water flow to needed areas and preserving expensive plantings. It creates different spaces with different functions. Efficient irrigation systems are planned so they can grow along with the garden. Hardscapes, the areas of a landscape that are permanent, and constructed elements such as patios, walkways and trellises – even putting greens – are sketched out. Phased approaches are planned so that homeowners can build their dream designs over time, not in one fell swoop. Lindgren’s design team doesn’t overlook lighting, which is crucial to a successful landscape design. Well-designed lighting highlights important features and adds drama. It also makes the outdoor space more functional — you can’t fully enjoy an outdoor space in the dark. optimal level, because it’s not just the cost of repairing a system that has impact on a client’s budget, it’s the cost of water usage, as well. Garden beds are top-dressed with fresh mulch. Water features, hardscapes and lighting designs are kept in tip-top condition. The team: (Top) Landscape Architects Mitch Benshoof and David Schmidt; (Bottom Left) Senior Designer Georgia Perry and Landscape Designer Kristen Whitehead; (Bottom Right) President and Owner Tim Lindgren. team of volunteers worked with the Associated Landscape Contractors of Colorado to build the Sustainable Backyard at The Gardens on Spring Creek in a single day. And in March Ami will travel to Haiti for the third time, delivering care packages to an orphanage in the town of Desire, where she and their daughter will also spend time working with children to improve their English language skills. Unemployment rates in Haiti top 80 percent. English speakers are more employable. When children are taught English, life-long opportunities are created for them. What’s in the future for Lindgren Landscaping? Only good things, according to Tim. “We have a good, strong team that takes pride in their work,” he says. “We put the same care in every project, whether it’s a small courtyard or patio or a $1 million project. Our clients know this and appreciate it.” And this makes 2014 look to be a very, very good year. Michelle Venus is a freelance writer based in Fort Collins. The Bucking Horse development on Timberline and Drake Roads. Northern Colorado is in the middle of a “We’re not in Kansas, anymore” moment. Communities like Fort Collins, Loveland, Windsor and Greeley are experiencing a development rebound not seen since pre-recession years. The difference between now and 2007 is that building has expanded beyond the boundaries of larger towns like Fort Collins, exploding into the rural communities. And the buffer between all the Northern Colorado towns is growing smaller and smaller. recently available data year), it was 310,487. Some natural increases in population are expected, but net migration is the larger force at work in Northern Colorado. In the next five years, Larimer County will add over 35,000 more citizens, 75 percent of whom will be coming from somewhere else. By the end of 2030, Colorado Department of Local Affairs estimates that the county’s population will be just under 425,000 people. Eric Thompson, President of The Group Inc.
With all those homeowners looking in Fort Collins, combined with net migration, finding an affordable house in Fort Collins is tough. Thompson says, “It’s unfortunately becoming unattainable for some people to buy here. So that’s fueling some demand in other places like Greeley, Wellington and Johnstown at the lower price points of $250,000 and under.” First-time homebuyers are moving east and south to find comparable homes for much less money. Laner agrees. “There used to be somewhat of a stigma against moving east of Interstate Highway 25. That’s not the case so much any more. Partially because of beautiful developments like Water Valley in Windsor and... partially people may not have a choice. But when buyers do go out there, they see nice houses that cost $60,000 to $70,000 less than the same product in Fort Collins. Also, Weld County towns like Milliken are receiving huge tax revenue from oil and gas companies like Anadarko, which gives them great ability to make improvements in the town.” Both Laner and Thompson agree that the outof-state transplants moving here are bringing a more relaxed attitude about long commutes. Thompson says, “Those of us who live in Fort Collins think of Denver as a separate place, but it’s only an hour away. People coming here from other cities like Houston or Atlanta are very much accustomed to an hour commute.” This is another reason communities in close proximity to the interstate are seeing growth. Centerra in Loveland is one of those communities that commuters are going to be taking a second look at in coming months. It is well positioned to offer the amenities Northern Coloradan’s love with easy access to the interstate commute their jobs may require. To be clear, Centerra is much more than the Promenade Shops at Centerra. Though many people assume that’s all there is, the McWhinney-owned property called Centerra extends for 1,500 acres on either side of I-25, extending from roughly Crossroads Blvd. to US Highway 34. Jay Hardy is a McWhinney VP and general manager of Centerra who previously served as the executive director of the Fort Collins Downtown Development Authority in the late ‘90s. He says, speaking regionally, that large landholders like the McWhinneys are taking the role of land stewards seriously. “I think the people that do a really good job [of developing sustainably] are those in large landholding positions.” Case in point, the newest Centerra housing development to break ground is 300 acres with 768 homes along Boyd Lake Avenue in Loveland. Called The Lakes, it will blend townhomes, single family homes and luxury patio homes at price points ranging from $250,000-$550,000 and up. Models will begin construction in April following infrastructure improvements along Boyd Lake Avenue late this winter. Grand opening is expected around August 1, 2014. Hardy says, “We have long believed that this location will be successful because it sits at the epicenter of Fort Collins, Loveland and Windsor. It has healthcare, it’s close to the interstate and will be home to the High Plains Environmental Center. Oftentimes people pit environmentalists against developers, but we fund the center, habitat protection and open space through our development activities.” The new neighborhood will host 27 miles of walking trails. Add to that, The Lakes is adjacent to a planned Thompson School District K-8 public school (tentatively using the name, High Plains Academy). Why build all these houses? Hardy replies, “Northern Colorado continues to add jobs. Apartment vacancy rates continue to be incredibly low. This will drive more buying. So the housing market has now come back to life.” According to Hardy, currently there are 8,000 jobs (at Centerra) and 6,000 people calling the intersection of I-25 and Highway 34 home. But change is on its way. The state demographer predicts that by 2025 (11 years from now), there will be 44,000 jobs and 25,000 people living at the intersection of Highway 34 and I-25. This more than any other reason is driving the growth of Loveland, Windsor and the communities that surround it. Watch Spots Post-recession, new construction has officially returned. While there is development and new building all across the region (you can’t swing a dead cat without hitting a crane these days), these specific locations will likely transform their immediate neighborhoods. To return to the initial question of Northern Colorado’s changing identity, certainly the rapid increase in population is forcing an explosion of building. Who better to ask about regional trends than Hardy, who was a key player in developing chunks of Old Town Fort Collins, The Ranch and now Centerra. Hardy outlines the observations he has garnered across 20 years in the business. “I would say, Northern Colorado continues to deliver. Though the sales tax revenue continues to be the piece that communities live and die by [and compete fiercely for], I’m starting to see cities working together more. We’ll get great mileage in connecting the trails between Fort Collins, Loveland, Greeley and Windsor. This project is creating great cooperation between the communities. I see that barrier and competition breaking down to create a connected region. And that connected region is really the thing that will make Northern Colorado great as a whole.” Embracing connectivity will be a must since the footprint of the expanding communities is steadily creeping together. From Fort Collins to Timnath, and Loveland to Windsor, the boundaries of the region are becoming less delineated. But, unlike other U.S. metropolitan areas, Northern Colorado leaders seem to be committed to keeping some open spaces open. Thompson says, “It’s not really a matter of stopping development, but asking what do we want it to look like? Will we retain that small town feel? We’ll see. That all comes down to vision and leadership. But personally, I believe yes. Just looking at the people here and the commitments they have, this will continue to be a special place.” Corey Radman is a regular contributor to Style Magazine. Contact her at www.fortcollinswriter.com. Timeline: First occupancy of manufacturing facility in fall 2015. Further construction will continue after that. Woodward spokesperson, Karl Johnson, says, “Everyone recognizes that a healthy Old Town is good for Fort Collins. We know our investment in this new facility can help attract other investment, and we think of Lincoln Ave. becoming much like Harmony Road where there is a good balance of businesses and residence. “The Lincoln Ave. facility reflects our desire to remain in Northern Colorado as we prepare to accommodate our current work and the work to be won.” Woodward is a manufacturer and innovator for energy and aerospace markets. Max Flats, on the corner of Mulberry and Mason Streets, is a student housing development projected to be complete by August 2014. Real estate is an industry with specific lingo and layers of complexity that can take a lifetime to learn. Within the real estate market, there are brokers who specialize in a variety of areas, but the most common are residential and commercial. family homes continue to rise. On the commercial real estate front, the desirability of places like Fort Collins continues to drive up retail rents, forcing some businesses to relocate or call it quits. In Greeley and Loveland, industrial space is difficult to nearly impossible to find, leading to the potential for new construction in the near future. These challenges in the rental market also represent opportunity; opportunity for growth and future financial stability for the region. industrial leases in Greeley have crept up to the $6.50 range from a low of $5. These are triple net rates, meaning the tenant must pay additional money for taxes, insurance and maintenance on the property. Most commercial rents are triple net leases. As an example, if a property is listed at $7 a square foot, that number does not include the “three nets” that will also be owed. While industrial space is virtually impossible to find in Greeley, office space is available, partly due to the consolidations taking place in the healthcare industry across Colorado. Doctors who owned their own clinics have now gone to work for Banner, Kaiser or University of Colorado Health, and those doctors’ buildings are now on the market. “That’s both a positive and a negative,” says Jim Vetting, a broker with Wheeler Management. “People are moving into the area to fill these positions for Kaiser and Banner.” Those people referred to by Vetting need homes. Greeley has seen a tremendous amount of activity on the residential development front. There is a series of projects planned in response to the city’s 1.4 percent vacancy rates in multi-family housing. In fact, nearly 1,000 multi-family units are scheduled to be built or are currently under construction. Downtown Greeley has seen several new restaurants come in, plus new retail and even some residential space. Restaurant property runs between $8.50 per square foot to a high of $11, and with a new downtown hotel and convention center on the horizon, the future for the area continues to look bright. Outside of Old Town, Front Range Village on Harmony, anchored by the Super Target, is a hot area. A lot of progress has been made here over the last three to four years. Thanks to the owners working with individual tenants on creative lease plans, the Village is near full occupancy. Other hot spots for growth have been the Drake and Shields area and Drake and Timberline, an area boosted by nearby residential development. Only time will tell how the new Foothills Mall redevelopment will affect the market. Malls are an entirely different animal, often setting their own lease rates and frequently, as in the case of the Promenade at Centerra in Loveland, they will not publically disclose those rates. Malls depend on big box stores to bring in shoppers, and will give these stores lower rent in order to attract other national chains that will pay top dollar lease rates, and a mall’s model normally only allocates 10 to 15 percent of the mall space to local retailers. It may seem that as rents rise in Old Town, some businesses may consider relocating in Loveland, but Kevin Klein, of Loveland Commercial, isn’t seeing this happen. With different cultural climates in each of the cities’ individual downtowns, it’s not necessarily always a clear fit for a business to move from Old Town Fort Collins to downtown Loveland, however, Loveland is seeing their own commercial growth. Heidi Kerr-Schlaefer is a freelance writer and the Mayor of HeidiTown.com, the place for information on Colorado festivals and travel. TUSCAN RETREAT This courtyard offered an opportunity to stimulate the senses while complementing the Tuscan appeal of the home. Each feature was designed to create an exterior space, which is as comfortable and intentional as the stunning interior of the home. Although itâ&#x20AC;&#x2122;s elegant enough for entertaining, the kids love splashing their toys in the channel style basin of the water feature. Builder Barry Schram lounges in the chemical free kitchen he built for the Miscios, visiting with Veronica and Andy. Veronica Miscio has become accustomed to delayed gratification. When she buys a pair of shoes, often ordered via a catalogue or website, they must sit in her third car garage or covered sun porch for three to four months. Ditto for husband Andy’s books, which he collects regularly from thrift stores and used bookstores. he items, no matter how eagerly awaited, have to spend their time exiled out of the home while they off-gas, slowly releasing the chemicals used to produce, manufacture, dye or otherwise get them ready for use. This process is one that Veronica repeats for all new possessions unless they come from a handful of stores she can trust, and when she ventures out into the public realm, she is often masked to protect her from the chemical smells emanating from other people and products. It is difficult to live in the beautiful state of Colorado and not prioritize your health and entertain green dreams of sustainability. Coloradans are surrounded by some of the most beautiful natural resources in the U.S. and we mean to enjoy them. But for the Miscios these matters are far greater than simple lifestyle choice. educated about the products we buy for our everyday lives. “Our best first line of defense is to become educated, smart shoppers.” For Veronica, a mild reaction to an environmental contaminant may be as simple as some dizziness or a headache. “That’s if I catch just a whiff.” A serious reaction will cause a heart arrhythmia and the tissue of her brain to swell. She must be constantly vigilant to avoid chemical triggers. Because of her sensitivity, Veronica cannot fly so the Miscios travel via a camper – and the camper has its own air filtration system to prevent the exhaust from aggravating her condition. Once Veronica had identified the cause of her poor health, she realized their 12 acres outside of town was exposing her to a great deal of agricultural fumes. At the same time, the retired grandparents wanted to simplify their lives to better enjoy their retired years. Left: Andy standing in his study with his extensive book collection. Right: Veronica selected this vanity to be replicated from a Pottery Barn catalogue; her version is built with approved adhesives and natural materials. chemical free products cost little more than the standard chemical-laden versions popular today. While aesthetics were important, they were far overshadowed by Veronica’s health concerns. However, the home was created to be bright and open with lots of natural light that takes advantage of the countryside views. Veronica even had the cabinet supplier make her a custom bathroom vanity based on a design she fell in love with in a Pottery Barn catalogue. He was able to recreate the furniture-inspired piece at the same price as the original but without the normal chemical contaminants. They also had a challenge during construction – they couldn’t just rent a temporary home or apartment. So they had the initial part of their home constructed so they could live there while the remainder of the home was built. An off-gassing room, the third bay of the garage, is an essential room for the Miscios to transition new items into the home. It now serves as guest quarters when they need extra space. Carson Design Studio 413 Cormorant Court, Fort Collins (970) 481-3366 With the Miscio’s, we took some time to get to know them and understand their lifestyle. We took note of what was important to them. We also studied the site, the views that it presented, the slope and lay of the land, the prevailing wind and the solar orientation. We took all of this into consideration with our collaborative design approach. Colorado Fine Woodworks (970) 402-1648 www.ColoradoFineWoodWorks.com For the Miscio residence, Colorado Fine Woodworks used LEED compliant plywood, adhesives and finishes to achieve a clean, simple look in the kitchen and a more traditional feel on the double master bath vanity, which was built to replicate a piece found in a popular home furnishings catalog. We were pleased with the results, and look forward to designing and building many more projects that are people and environmentally friendly! Fort Collins Heating and Air Conditioning, Inc. 208 Commerce Drive #4, Fort Collins (970) 484-4552 | www.fortcollinsheating.com Fort Collins Heating and Air Conditioning provided the design and installation of the home’s cooling, ventilation and filtration systems. The systems were designed with the overall concept of the home in mind, targeting specific areas for comfort and indoor air quality and the installation was completed using materials and techniques consistent with the homeowners’ requirements. Liebl Landscape 1022 Willows Bend Dr., Fort Collins (970) 215-9937 | www.liebllandscape.com The Miscio’s came to us needing landscape design and landscape construction services. They envisioned a landscape that would complement the unique style of their home and blend with the surrounding rural neighborhood. They were looking for a yard that would be aesthetically pleasing and still low maintenance, water efficient and sustainable for their climate. After a couple of weeks, the dream became a reality with the completion on schedule and on budget. The Light Center 2725 S. College Ave., Fort Collins (970) 226-3430 | www.lightcenterinc.com The Light Center was privileged to provide chandeliers and living room, dining room, master bedroom and stair sconces… as well as all ceiling fans, rope lighting in the living room cove (indirect lighting) and all bath vanity lights. We furnished ceiling fans and track lighting for Andy’s office and Veronica’s den. Xenon undercabinet and puk lights provided accent and work light. The finishing touch was beautiful fixtures on the exterior of their home. A beautiful home for some beautiful people! Siena Wood Floors 4562 Denrose Ct., #3, Fort Collins (970) 484-1688 | www.sienawoodfloors.com We installed a prefinished Red Oak floor over radiant floor heat in the back entry, kitchen, dining room, family room, study, and master and guest bedrooms. The floors consisted of a 3-, 4- and 5” random pattern. We also supplied the treads and risers for the project. To suit the Miscio’s needs for a chemical free home, we used a low VOC glue. A selection of cider and perry tap handles at Scrumpy’s in Fort Collins. It’s exciting time in the cider industry, especially in Northern Colorado. “Production doubles almost every year,” says Jennifer Siewald, who owns Fort Collins’ cider bar Scrumpy’s that opened last spring. She is referring to production in the U.S., where cider has become the newest trend after craft beer and artisan distilleries. A taster flight of some of the 16 ciders, perrys and meads at Scrumpy’s. Top Left: Jennifer Siewald, owner of Scrumpy’s. Top Right: Hopricot, one of Siewald’s creations. Bottom Left: Thirty-five barrel fermenters at Compass Cider. Bottom Right: The team at Fort Collins’ newest cider establishment, Compass Cider: Toby Osborn, Tim Lang, Elizabeth Woodworth and Bob Blythe. Joel Gott 2011 Cabernet Sauvignon is a blend of 100 percent cabernet sauvignon grapes from several regions of California including Napa and Paso Robles, which helps to create the aromas of cherry, blackberry, cinnamon spice and vanilla toast. On the front of the palate the wine has silky yet robust tannins, ending with a soft finish and lingering minerality. Pair this with a nice steak and some blue cheese crumbles and you will have a memorable Valentine’s Day. The Immortal Zin is an Old Vine Zinfandel from Peirano Estates in Lodi, Calif., where the cool summer nights have given the fruit a chance to develop layers of flavor starting with subtle aromas of black cherries and other red fruits with slightly spicy characters. Once past the aromas, your palate is bathed with a layered mix of sweet red cherry and cocoa that has a smooth velvety finish. This is a great stand alone wine or it pairs well with beef or pork – and let’s not forget about dark chocolate. Dead Bolt Winemakers Red Blend from Philip Laffer has quickly become a favorite for many because of the elegance and bold flavor of the cabernet sauvignon and merlot grapes that is complemented by the smooth finish of the varietal grapes of zinfandel, petite syrah and syrah. This combination of fruit pleasures both the forward and back of your palate, and goes well with a nice steak or even a burger or pizza. J Pinot Gris represents some of the best of California’s pinot gris with its enticing aromas of apricot and t ro p i c a l / p i n e a p p l e fruit. As you begin sipping, your mouth bursts with flavors of lemon and lime and finishes with a hint of kiwi and sweet orange blossom honey – a complementary balance of fruit and acid on your palate. This wine pairs well with seafood like grilled salmon topped with a spicy mango salsa. Breckenridge is known as a world-class skiing destination, but it was once a destination for gold and silver hunters. While the townâ&#x20AC;&#x2122;s colorful history sets it apart from many other Colorado ski resorts, it is also a thriving community of creative individuals who are working to make Breckenridge the best it can be for future residents and visitors. Select” Demonstration Garden, a collaborative effort with Denver Botanic Gardens, Colorado State University and regional and national growers. The club reports to PlantSelect.org on the growth and survival rates of these test plants at 9,600 feet above sea level. The Breckenridge Alpine Garden is always a work in progress, but visitors are invited to sit and stay awhile. You can also visit some of the other area gardens listed on the club’s website at SummitCountyGardenClub.org. center and a focal point for summer activities. It is used during the winter as well, most recently during Ullr Festival in January. “The art environment in Breckenridge is alive,” says Jenn Cram, a Town of Breckenridge city planner working in the arts district department. “There’s a lot of excitement and opportunity for observers and those who want to try a new medium.” “Our environment is so inspiring,” she adds. “Breckenridge attracts expressive people who live life to the fullest by biking, skiing, making art and more.” If you’d like to make art while in Breckenridge you’re are invited to take classes and workshops. These events are typically two to three hours and hosted by artists at the Quandary Antiques Cabin and Ceramic Studio, the Fuqua Livery Stable and the Tin Shop. Classes include painting, jewelry, drawing, textiles, ceramics and more. A full calendar of these artsy learning events can be found at BreckArts.com. After you get off the slopes or the biking trail, there are many behind-the-scenes activities awaiting you in Breckenridge. For history buffs, theater lovers or inspiring artists, it’s all waiting for you in Breck. For travel and event information and a full calendar of events for Breckenridge, go to GoBreck.com. Heidi Kerr-Schlaefer is a freelance writer and professional blogger at HeidiTown.com. Her articles have appeared in IndependentTraveler. com and EnCompass Magazine. sitting weather tight now, thanks to the hard working team at Affordable. No matter how big or small your roofing project, Affordable is there for you. Call them at (970) 207-0000 or visit www.AffordableRoofingInc.com for more information. family focus three months’ worth of living expenses in case of an emergency.” You know, the stuff we adults should know but often ignore. TheMint.org also provides educational materials to parents and teachers. The website offers the following five rules for parents when it comes to money matters (see the blog, www. mint.com/blog/): 1. Teach kids the difference between a “need” and a “want.” These lessons are most clear to children when they reach school age. Explain the difference in a relatable way: what do you need to eat to survive versus what do the want to eat because it tastes good? 2. Discuss all aspects of money. Not just spending, but saving and investing. Show them bills, how you budget, etc., allowing them to see that as parents, you don’t only use money to make a purchase at a store. 3. Give kids an allowance. Connect it to chores, the website recommends. This creates an early relationship between money and work. This can often create a more entrepreneurial child. Some sources recommend half their age in dollars each week. Threejars.com is website designed to help kids learn to manage their own money in a fun and creative way. Research has shown that children as young as 3 years old begin to guide their behavior. By age 7, they can begin self-regulating their behavior. Even at young ages behaviors surrounding money can begin to be understood and acted upon. Good planning and a little help can teach your children the healthy and practical view of money that will take them into adulthood. The website moneyasyougrow.org is designed to help families, community organizations and others to teach kids lessons about how to save money, make good money choices and avoid debt. The website is broken into age groups: 3 through 5 years, 6 to 10 years, 11 to 13, 14 to 18 and 18 years and beyond. Each group is given age-appropriate information about money to learn to live financially smart lives, with activities to help cement the information. DowntownFortCollins.com Downtown events happen all year round, but a few big festivals coming up in early in 2014 are: Great Plates of Downtown: Over 30 fabulous downtown restaurants offer amazing evening dining specials for a full two weeks to show off their specialties! In addition to great dining experiences the event collects community donations totaling over $35,000 last year for the Food Bank for Larimer County. Lucky Joe’s St. Patrick’s Day Parade: This event is the oldest in Downtown Fort Collins. Over eighty entries each year share their community spirit and Irish flair with this traditional parade. FoCoMX: The Fort Collins Music eXperiment offers over 200 local and northern Colorado bands all in one weekend! The 2013 Celebrating Women Gala presented by Friends of A Woman’s Place celebrated its 20th Anniversary this year. The signature evening honored seven outstanding women for their leadership and community involvement and helped to raise awareness of the issue of domestic violence. The more than 400 friends and supporters that attended the event enjoyed musical entertainment by UNC’s Jazz Lab Band I and a champagne and dessert reception. Proceeds from the evening will support the safe house, A Woman’s Place and their programs for women and their children who are victims of domestic violence. Photos courtesy of Shadowfax Photography. Front-Lila Kinnick. Back-Robyn Kinnick, Christi Malnati, Brooke Payne, Devon Carr, Sara Malanti. Renowned speaker and former Denver Bronco Reggie Rivers delivered an inspirational message for the 100 people in attendance at this luncheon. The event spoke to the benefits of mentoring and the impact the Partners Mentoring Youth program has had in Greeley. The luncheon helped to raise over $20,000 for Partners in Weld County and their programs to create and support one-to-one mentoring relationships between positive adult role models and youth facing challenges. BBB CENTER FOR FRAUD PREVENTION LAUNCH October 29 :: Budweiser Event Center :: Loveland The Better Business Bureau Institute for Marketplace Trust, formerly called BBB Foundation, launched its BBB Center for Fraud Prevention at this invitation-only event. More than 100 small business owners along with representatives from law enforcement and regulatory agencies in Northern Colorado and Wyoming attended the breakfast and a panel discussion about the consequences of consumer and business fraud and how to fight back. Photos courtesy of Superior Imaging. and The Laughing Photo Booth. M C K E E P R E S E N T S . . . A S I X T I E S C E L E B R AT I O N ! November 2 :: Embassy Suites :: Loveland A great evening greeted more than 250 business owners, physicians, community leaders and McKee Foundation supporters at this Sixties Celebration presented by The Friends of the Hospital. Guests enjoyed specially prepared delicacies, bingo and billiards, a live auction, a photo booth and plenty of good ‘60s music to dance to. The 2013 McKee Foundation Philanthropy Award was also presented to Lynn Matson for his volunteerism and support of McKee Foundation. More than $75,000 was raised to benefit scholarships for the Stepping Stones Adult Day Program at McKee Medical Center. Photos courtesy of Steve Glass Photography. FA L L I N T O J E W E L S November 7 :: Fountains of Loveland More than 225 women enjoyed the ultimate shopping experience at the Fall into Jewels event. Women queued to be first in line to shop from thousands of displayed precious, semi precious and designer jewelry pieces as well as scarves and purses that were donated throughout the year by the community. Wine, hors ‘d oeuvres and live music added to the girls’ night out. More than $13,000 was raised at this 7th annual signature event and will benefit House of Neighborly Service and their many programs servicing the community since 1961. Photos courtesy of AMA Divine Photography. CROSSROADS SAFEHOUSE 33RD ANNIVERSARY GALA November 9 :: HIlton :: Fort Collins Generous sponsors, donors and guests enjoyed a magical evening of fundraising at the Crossroads Safehouse Anniversary Gala. The signature event provided nearly 475 guests a spectacular silent auction experience and a gourmet dinner to the music of a Fort Collins Symphony String Quartet, followed by several lively auctions. More than $200,000 was raised to benefit Crossroads Safehouse and their mission to provide a safe environment for victims of domestic and interpersonal abuse and violence in Larimer County, while promoting positive change through education, awareness and intervention. Photos courtesy of Photography Collaborative. R E S P I T E C A R E H O L I D AY B A L L 2 0 1 3 November 16 :: Embassy Suites :: Loveland Respite Careâ&#x20AC;&#x2122;s 31st Annual Holiday Ball was an evening to remember for the nearly 725 guests in attendance. The Gatsby-themed gala provided an elegant backdrop for the festivities. The celebration began with a champagne toast and silent auction. Emcee Mike Nelson welcomed guests and opened with a video presentation demonstrating Respite Careâ&#x20AC;&#x2122;s 31 years of service to the community. The evening included dinner, a live auction, a car raffle and much more. The event raised a record $256,000 for Respite Care and their programs to provide short-term care to children in Larimer County with developmental disabilities and respite to their families, enhancing quality of life for the entire family. Photos are courtesy of Nicholas Perea. R E A L I T I T E S F O R C H I L D R E N C H A R I T I E S N I G H T L I G H T S C E L E B R AT I O N December 1 :: First Presbyterian Church Front Lawn :: Fort Collins More than 1,000 bundled-up community members gathered to support brightening the lives of abused and neglected local children at the 16th annual Nightlights event. Scores of families came out to enjoy an evening of hot chocolate and cookies, music from The Dickens Carolers, photos with a Belgian horse and carriage, award presentations and more. The highlight of this event was the lighting of the one-of-a-kind 50-foot tree adorned with beautiful indigo LED lights and the images of children. A record $127,000 was raised for Realities for Children to help benefit abused, neglected and at-risk children in Larimer County. In December alone, Realities for Children served more than 2,000 children. Photos in part courtesy of Angela Kay Photography. Jep Enck, Nancy Richardson, Jennifer Varner, Kurt Richardson The Richardson Foundation was one of the 2013 NightLights sponsors. Winner, Carver, poses with his 4â&#x20AC;&#x2122;, 33-lb edible chocolate Santa. 2ND ANNUAL GINGERBREAD H O M E F O R T H E H O L I D AY S ! December 7 :: St. Elizabeth Ann Seton Parish :: Fort Collins An afternoon of competition awaited 26 teams as they worked to decorate gingerbread houses in this timed event to raise awareness and funds for The Center of Family Outreach. Teams with members of up to three had two hours to create their works of art. Awards were presented to the top three decorated houses. The fun event raised $18,000 for The Center of Family Outreach and their programs offering education, intervention and support for families who are challenged by the adolescent years. Photos courtesy of David Johnson and Sue Wagner. L A U N C H O F L O V E L A N D ’ S VA L E N T I N E S E A S O N January 7 :: McKee Medical Center :: Loveland As the day of love or Valentine’s Day approaches, the Sweetheart City, as Loveland is known, officially unveiled its Valentine Season with the help of the Loveland Chamber of Commerce and various representatives. Presentations of Loveland’s Valentine Card, Valentine Cachet stamp and Valentine postal stamp for the Valentine Re-mailing Program were made public as well as Loveland’s Official Valentine’s Brew, and Valentine Blend of coffee. Valentine’s Day activities as well as Date Night getaway packages were announced. Loveland is gearing up and sending a flood of love to us all. Style Media & Design, Inc.